I’d never heard of this artist until just a few days ago, but I’m so delighted to have been introduced to his work. This painting made me look for warm textury shades of russet and rust, as well as wavy misty greeny/bluey tan clouds in the sky. Basically I made up some words, but the potential within this painting is amazing. Lovely outfits, beautiful colours, but I miss the gorgeous blue of the painting. Really lovely. Still, not sure blue goes with these colours. Or does it? The colors in this painting are gorgeous. There must be an Hermes scarf floating around featuring these colors. I could happily live in these color combinations for a very long time. And I like turquoise with brown and taupe, once I got over the idea that it is summer jewel leery only. What a great wardrobe for a redhead! Just what I was thinking – a warmish strawberry red, I think. Lovely warm reddish brown in those first outfits! My favorite so far! This winter I'm experimenting with mixing brown/tan with gray. This gives me even more ideas! Thank you for including casual outfits in the mix. I love looking at the formal outfits, but casual fits my life better. Stylish, casual feminine is challenging to achieve (if you are over the age of 18). I recognized this artist right away. Born in my hometown of Brantford, Ontario. He was 1 of The Group of Seven. A group of Canadian Landscape painters. Emily Carr was added later. She has some beautiful works too. What a nice touch to add the maple leaf in the vignettes. I must say the clothing choices are beautiful too. A very nice match! Actually, Emily Carr was not a member of the Group of Seven, but she did associate with them. I am so in love with these colors!! There are several pieces here I would love to have in my closet and the art is wonderful….thanks Janice!! 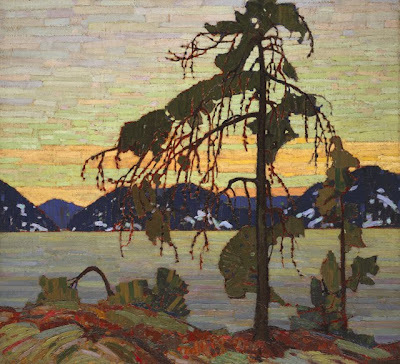 Actually, Tom Thomson was not a member of the Group of Seven but he had a significant influence on them. The group was formed after he died. Color and texture in separates, oh my! You have given me a list of many favorites over the years, but this may be The One. As Virginia said, stylish, casual feminine is challenging to achieve. I've said it before; we've said it before, but you teach something each and every post. Thank you! Now here I go again, all this inspiration stimulating all the sewing impulses! So beautiful! I love how you just pull the colors out of the painting (or scarf) and build a coordinated wardrobe around them. Very inspirational. Love that Canadian painting from Lawren Harris. The Group of Seven and Tom Thomson are great sources of inspiration for choosing colours for my home decor and capsule wardrobe. Thanks for posting it! I love this palette. Lawren Harris' daughter was a friend of my mother-in-law. The colours are perfect for a redhead transitioning to grey. Oh my, I am really struggling to find how to contact you! I have a rather dark and dramatic "start with art" request, I'd love to see what you could do with Turner's Dutch Boats in a Gale… Hopefully you will feel as inspired! This is a delightful way of introducing your readers to some wonderful artists. You must have been a teacher in your former career…? Please I am begging you. We get it already. One scarf can go with many outfits in any season. Enough already – you have made your point. Move on – it is getting boring. And insulting to think you think we need to be told something so many times before we get it. I will never understand people who grouse about websites that no one is forcing them to read and that they've paid nothing at all for. If you don't like this blog, go somewhere else. There's lots of stuff (understatement) on the internet; take a break from the Vivienne Files and find another free, high-quality resource that provides you with new content nearly every day. I am enjoying these posts, not because I'm stupid and need to be "told" anything, but because they're attractive and inspiring. Besides, you know what they say — "only boring people get bored." Dear Neats. You must be a miserable soul. Go find another blog to read, or even better, produce a better blog than this one. Your cheerful, productive and positive feedback will not be missed. I believe you are the one being insulting. If you don't enjoy this blog..Why are you looking at it? I, too, am Canadian and this painting is stunning. As a redhead, though, I don't think this would suit me, at least not all of the clothes. Rust shades just wash me out. But I'm a "spring" redhead and I bet it would look great on a brunette/auburn complexion. If the colours were more tobacco brown, I think more redheads would be able to wear them — at least this redhead! I don’t think these recent posts are about scarfs as much as constructing a cohesive, year-round wardrobe around some rich, unexpected color combinations. Although these are not “my” colors, my inner artist continues to be inspired and delighted by your compositions. Thanks, Janice. Lawren Harris is one of my favourite artists — glad you have discovered him, Janice. I so appreciate how you take disparate pieces (of art, or a scarf…) and build a wardrobe around it. It makes so much sense that we are drawn to similar shades, tones, or styles in art, in our homes and in our own clothing choices. You've taken that a huge step forward by showing how to build a cohesive colour palette/wardrobe using colours we love in harmony with others we might not have thought about… Once again, thank you!